There are currently over 650 million Internet users in China and the number is continually growing, with the year 2014 showing an annual increase of more than 31 million (5.6 %), according to the 2015 Statistical Report on Internet Development in China. 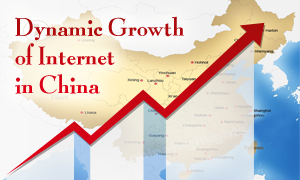 The dynamic development of the Chinese Internet led to an increase in the number of users of almost 250 million over the five-year period (420 million in mid-year 2010 as compared to 667 in mid-year 2015). The data presented in the report shows that the Internet penetration rate of 48.8 % (the percentage of people in China with access to a network) is still low compared with developed countries, for example the US with 85% Internet penetration rate. However, such a result may indicate that China’s Internet market has great potential for further development. The main reason for this low rate are the differences between the developed and under-developed provinces as well as rural-urban gaps. In China, about 89% of users access the Internet via mobile devices, predominantly tablets, whereas in the US, for instance, mobile Internet is utilised by approximately 67% of users. Urban areas show a much greater Internet usage than rural areas, where users constitute only 27.9%. The most web-savvy group are users aged from 10 to 30 years who make up for 55.2% of all Internet users in China. Along with the dynamic growth of the Internet, there could be observed an increase of e-commerce activities. Last year alone showed an increase of 12% in the number of online shoppers to 374 million. Close to 80% of Chinese enterprises use the Internet to handle office affairs, with a utilization ratio of fixed broadband reaching 77.4%. Furthermore, the percentage of enterprises carrying out online sales and online procurement is estimated to be 24% and 22% respectively. More and more often, enterprises carry out marketing and promotional activities on the Internet as well. In line with the growth trends on the Chinese Internet market there is a heightened interest in domain names under .CN. Currently, there are more than 12,345,000 domain names registered within the Chinese extension .CN compared to 10,768,000 in mid-year 2014, according to the Chinese Domain Authority. Most companies wishing to enter or mark their presence on the Chinese market tend to register domain names under .COM.CN or .COM domains whereas China-based native enterprises opt for .CN. The .COM.CN registrations constitute more than 14% of all domain names registered under the Chinese country code domain. It may be presumed, given the above observations, that that the golden age for the domain market is yet to come in China. If you are interested in the Chinese domain marketplace or wish to register a domain name under the Chinese country code domain, please feel free to use our search tool to check if the names that fit your needs are available. If you need assistance or more information, please do not hesitate to contact us by email at support@web-solutions.eu or via phone on +44 (0) 208 133 3994. No restrictions. Anyone can register any amount of Chinese .CN domains.